There are a number of things which I liked better from Mary Brown’s rather than the obvious KFC offerings. It’s strange though; I definitely like Popeye’s chicken much better than KFC in more ways than one, but what kept me coming back to KFC over the years is the sheer number of locations and where they are located. 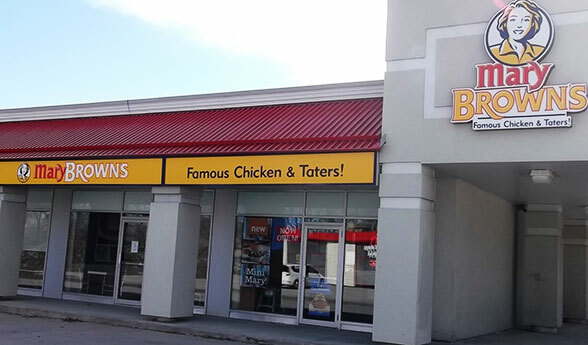 With a location in the same parking lot as the Value Village, and No Frills on Wellington St in Barrie, Mary Brown’s should do fine, but it’s not the same as having a restaurant in the Georgian Mall or beside a Walmart. The restaurant itself was very pleasing to eat in. Everything was cleaned very well, and sometimes the staff was cleaning up the tables immediately after customers leaved. I guess if you go you can be sure there will be a spot for you and/or your group. 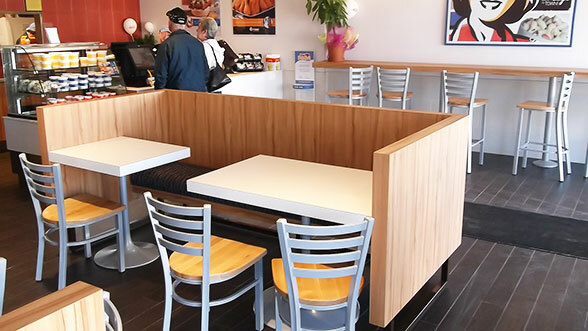 As well as the high standard of cleanliness, the restaurant still had that typical “new chicken joint” feel to it. I do like getting in on the action before a fast food place turns into a worked in machine like most Tim Horton’s franchises in Barrie have become. Not to say it’s a bad thing but the newness is apparent still. But, I’m going to say that for most customers, Mary Brown’s is going to be a takeout joint and it was apparent as we sat and waited for out orders. I can say that the lineup was surprisingly long at times, considering it was only 3PM on a Saturday. I guess I was surprised that people had already jumped on the Mary Brown’s bandwagon in just a few months of existence. After eating the food I realized why. A lot of times I go out specifically for taters and I can say the Mary Brown’s taters are easily the best I’ve had. They make their taters very crispy, with just the right type of salt and spice to them. Most places I’ve went to for taters, they were either kind of soggy or blandly spiced or over cooked so they tasted dry. This wasn’t the case at Mary Brown’s. The taters alone are worth returning for. About the fried chicken though, I can say it’s not quite as greasy as KFC or Popeye’s but has a wonderful seasoned flavour and succulence. I admit, it’s not the greatest food for your health but sometimes fried chicken just hits the spot. Other things on the menu include: chicken sandwiches, wings, wraps, chicken fingers, pulled chicken sandwiches. All meal combinations come with either macaroni salad or coleslaw. The price at Mary Brown’s was fair, and what I absolutely thought was a steal was the medium taters, which I specifically went back for after having a traditional chicken meal. The medium taters was quite large (chip stand sized) and only cost $6.00. 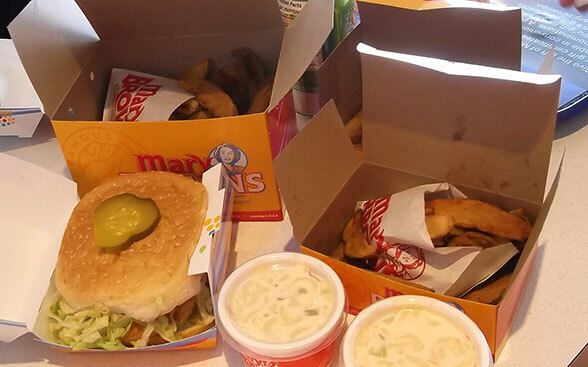 But I have to say, for the quality of chicken, and because I’m used to the quality at KFC, the prices at Mary Brown’s are entirely reasonable, and worth switching for, if you live in Barrie. All in all, I’m glad I tried Mary Brown’s. I don’t often eat fried chicken but if I had the urge again, Mary Brown’s would be the best choice. However, because the taters were so good, and I get my groceries from that No Frills, I’ll probably pick up the taters while I’m there.